An informal IDP camp in Dikwa (Borno state, Nigeria) where 191 households are settled. Their village, Kaza, has been occupied by Boko Haram for about two years. At least four civilians are reported to have been killed when an aid convoy transporting food supplies was ambushed by armed individuals in Nigeria’s strife-torn north-east region, the top United Nations humanitarian official in the country said. The attack took place along the Dikwa-Gamboru road in Borno state, and also resulted in the destruction of basic aid items initially destined to alleviate the suffering of thousands of conflict-affected women, children and men. “Violence against convoys carrying humanitarian aid is unacceptable and can result in concerning limitations in our ability to provide life-saving relief to those who need it the most,” said Edward Kallon, the Humanitarian Coordination in Nigeria, in a news release today. “We must ensure the safety of aid workers and aid convoys across the north-east of Nigeria, so people in need of assistance can access it in a timely manner and in sufficient quantity. Many lives are at risk,” he underscored. The conflict in Nigeria’s north-east provoked by the Boko Haram terrorist group has triggered a deep humanitarian crisis. Since the start of the conflict in 2009, more than 20,000 people have been killed and thousands of women and girls abducted. Borno along with Adamawa and Yobe are the worst affected with nearly seven million people in need of humanitarian assistance, more than 50 per cent of whom are children. Since January 2017, despite major challenges, relief efforts by the UN as well as partners have managed to assist over five million conflict-affected people, reaching about five million with health care assistance, three million with food security interventions, 936,000 with nutritional support, and over 1.3 million with safe drinking water. Owing to such humanitarian efforts, for the first time since the onset of the crisis, hunger has considerably declined in the region. According to the UN Food and Agriculture Organization (FAO), the number of people facing acute hunger has halved since June-August – from 5.2 million to 2.6 million people. However, there are fears that without sustained and timely assistance, the good work could quickly be undone, leaving more than 3.5 million people with acute hunger, as well as at the risk of famine, by August 2018, warned the UN food security agency. 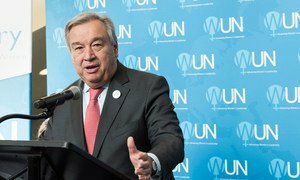 United Nations Secretary-General António Guterres has condemned the suicide attacks that took place earlier Tuesday in Adamawa state, Nigeria, which resulted in scores of casualties, and called for those responsible for the “heinous acts” to be swiftly brought to justice.